Introduction. Part I. The Contact Hypothesis Reconsidered. 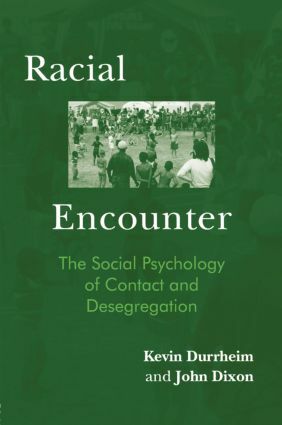 The Contact Hypothesis as a Framework for Understanding the Social Psychology of Desegregation. Contact and the ‘Ecology’ of Everyday Relations. ‘You Have to be Scared when they’re in their Masses’: Working Models of Contact in Ordinary Accounts of Interaction and Avoidance. Part II: Attitudes to Desegregation Reconsidered. Attitudes Towards Desegregation as a Framework for Understanding the Social Psychology of Desegregation. Evaluative Practices: A Discursive Approach to Investigating Desegregation Attitudes. Lay Ontologizing: Everyday Explanations of Segregation and Desegregation. Group Differences in Narrating the ‘Lived Experience’ of Desegregation. Part II: ‘Locating’ the Social Psychology of Contact and Desegregation. Dislocating Identity: Desegregation and the Transformation of Place. Conclusions: ‘Racial Preferences’ and the Tenacity of Segregation.